The character Pippi Longstocking, beloved misbehaver of children’s literature since 1945, doesn’t appear in this movie and is barely even mentioned. In her native Sweden, the name Astrid Lindgren is all but synonymous with Pippi, so the fictional girl doesn’t really even need to be mentioned in a biopic of its author. Her cheerful lack of regard for authority and proto-feminist views are demonstrated as informing her future work, but only indirectly; as the movie goes on, more questions and observations from her fan mail are heard on the soundtrack. “So many people die in your books, but when I read them I just want to live” another correspondent notes. Astrid’s own rage to live is not easily met by the life choices offered in rural Southern Sweden. Which partially explains why, when she gets a job at a local newspaper run by an older, married man, Reinhold (Henrik Rafaelsen) she finds an immediate affinity there. Not just because he’s clever and witty enough to captivate her with word-association games shortly after they’ve met. 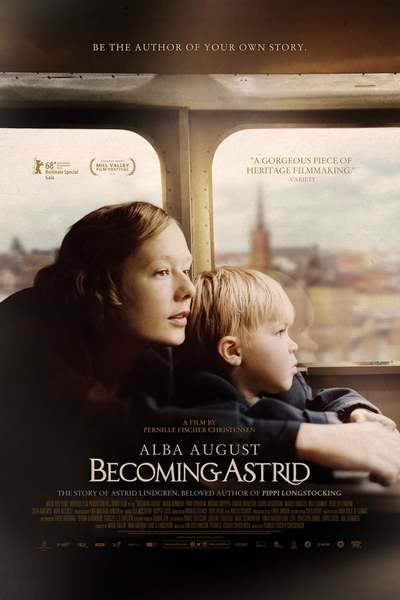 Traveling back and forth from Stockholm to Denmark—the latter place being one where she can bear the child in relative anonymity, and leave him in reliable foster care—Astrid suffers both physical privation (discussing with one friend whether to go to another’s house for a party, one in-favor argument is “she has firewood and a gramophone”—boy, the swinging 1920s!) and emotional frustration, as both the father of her child and her parents disappoint her on many points. In Stockholm she finds a less-than-rewarding secretarial job, for which she is direly overqualified. But she finds something else, too: a compassionate boss who’s a man of his word to her.